KGB is a digital band that answers the question “should I get a band or DJ?” KBG combines the best both with live music, recorded backing tracks and full DJ system. 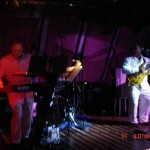 KGB is a band that plays everything from classic crowd-pleasing dance tunes to romantic ballads such as those done by Michael Buble and Frank Sinatra. If your audience wants the newest songs, we can do that, either singing them ourselves or DJ-ing on the break. Prince, The Temptations, Earth, Wind and Fire, Al Green, Bob Marley, Michael Jackson and Lady GaGa are a few of the artists we cover. This band has to be heard to be believed. You won’t be able to resist dancing, though. 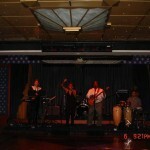 I believe this is the band I listen to on Wednesday nights at the Society Restaurant and Lounge in Silver Spring, MD. 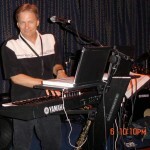 The band comprises of a keyboardist (the leader I think), William — a phenomenal guitarist, and the always entertaining and talented vocalist. They are amazing to listen to and to observe while having cocktails, the best appetizers and delectable dinner (if you have the belly space). I am taking work colleagues with me tomorrow night to hear this band with the view to consider them for our holiday party in December. My husband Mack and I are regulars on Wednesday nights. Whether or not my colleagues decide to reach out to the band for their availability after hearing them play, I am glad I that I will be hearing them tomorrow night. I know they won’t disappoint as they are always off the chain — AMAZING!! !